Cold and wet conditions didn't deter large numbers of people attending the NZ National Agricultural Fieldays at Mystery Creek in mid-June near Hamilton. PF Olsen exhibited a stand in the Premier Feature (main) Pavilion. 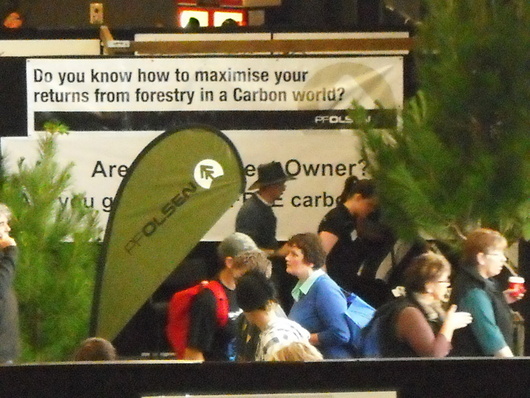 "We were pleased to have secured an indoor site this year, commented Sally Haddon, a PF Olsen Forestry Manager based in Rotorua. "At least people could get out of the rain for a chat". A corner site in the Premier Feature allowed us to catch up with old faces, and meet new ones. It was great to catch up with old faces, and meet a whole lot of new ones. We could see there is widespread interest in forestry at many levels, and it is clear that increasingly, farmers are seeing an important role for forestry as a viable option for better matching land use with land capability. The main themes of the PF Olsen exhibit were Harvest-Ready, Carbon Forestry, and Digital Mapping. "We had hoped that there would have been more certainty around Carbon Forestry at this stage", points out Peter Weblin, PF Olsen's Marketing Manager. "But we are still awaiting the outcome of the Select Committee's review of the Emissions Trading Scheme." Thanks to everyone who supported our stand, it was great to see/meet/chat with you! We will try to contact all those that indicated they wanted follow up, but if you feel you are getting left out, please contact us on FREEPHONE 05008 PF Olsen (05008 736 5736), or e-mail us on info@pfolsen.com or visit our website www.pfolsen.com.